New Zealand’s second earthquake in five months is a human tragedy – with more than 100 confirmed dead so far, and more than 200 missing. It could also be the worst insurance catastrophe since Hurricane Ike hit Texas in 2008. Guy Carpenter published the attached map showing the epicenter and shake zone from this week’s earthquake. The cat modeling firm AIR estimates insured losses between US$3.5 billion and US$8 billion. JP Morgan estimates $12 billion. In comparison, Ike cost $12.6 billion in the U.S. alone, and $20 billion including all Caribbean basin countries, with all numbers updated for inflation. Last year’s earthquake in Chile totaled about $8 billion in insured losses. This week’s earthquake was technically an aftershock from a September earthquake, though all parties appear to be treating them as separate events in terms of insurance coverage. AIR’s original estimate for that event was $2 billion to $4.5 billion. Actual industry losses have come in at the top of that range. It’s important to note AIR’s estimates exclude demand surge – the phenomenon in which construction costs soar because of shortages in labor and raw materials. This week’s earthquake was considerably smaller than September’s – magnitude 6.3, vs. 7.1, according to the U.S. Geological Survey, which monitors worldwide seismic activity. But the recent event’s epicenter was just three miles from Christchurch, a city of 400,000 and was relatively shallow, just 2.5 miles beneath the earth’s surface. 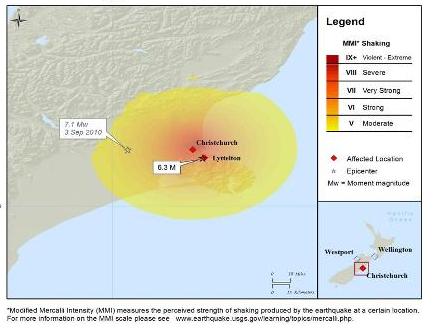 New Zealand insures earthquake and other natural disasters through a government-related Earthquake Commission, according to a I.I.I. press release. In existence since 1945, it has built up assets of more than $4 billion in U.S. dollars. It also purchases reinsurance in the private worldwide market, New Zealand Prime Minister John Key told that country’s National Business Review. A I.I.I. list of the largest natural catastrophes worldwide can be found here.